Encourage activity without getting up out of your seat! Focuses on seated stretches and movements. Complete each before marking the game card. 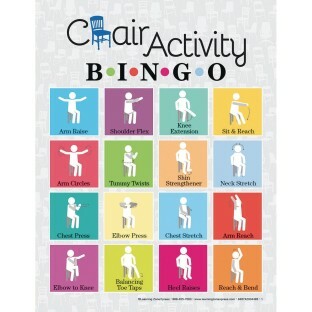 Perfect for use with older adults. Great for all ages and anyone with limited mobility. Encourage physical activity without having to get up out of your seat! 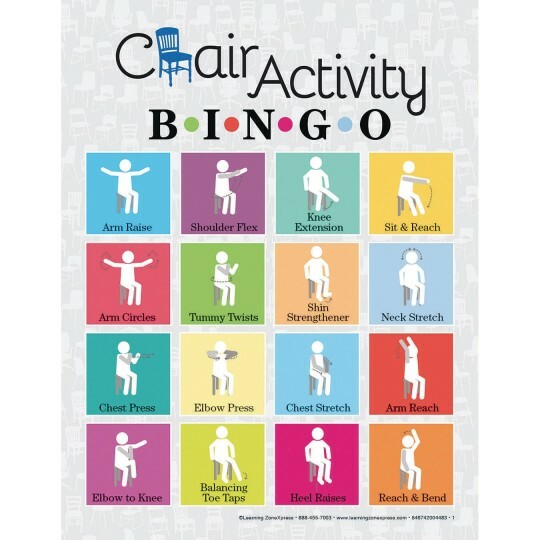 Chair Activity Bingo focuses on seated stretches and simple movements that must be completed in order to mark the game card. Perfect for use with older adults and great for all ages and anyone with limited mobility. Includes 30 laminated 8-1/2" x 11" bingo cards, playing cards and instructions. Chair Bingo Activity a Hit! In a group setting if a person has the exercise picked they come to the front of the room to perform the activity. This enables several people to participate and provides additional movement opportunities. I purchased this for use with Adults with Developmental Disabilities and it is great! The group I work with loves bingo any kind of bingo but a lot of them are reluctant to do any type of physical activity. So when I found this I thought this would be a great way to introduce a new Bingo game and get them to do a little exercise ... until I saw the price which was more than I am usually willing to spend on a Bingo game. The concept seemed so perfect for the people I worked with that I decided to splurge a little and order it. The people I work really enjoy the game and have really gotten into mastering the exercises. I'm still not pleased with the price especially considering it did not come with its own bingo markers and it is stored in an over sized zip-lock bag but I definitely do not regret spending the money.